As part of this year's model program, the #flygirls were able to model dresses from Girls' Night Out in Swansea, IL. 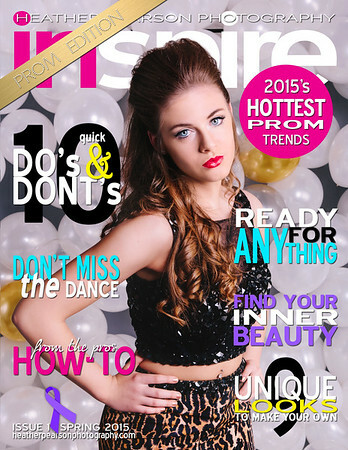 Using those images, we planned to put together our first digital magazine showcasing the dresses, which would include some fun trend info and articles about prom. It was during the editing and design process that I heard about a young girl in our community who was preparing to fight a battle I just couldn't conceive. My heart went out to her, her family, and her friends. Some of those same friends are part of my model team. So, I knew even more we had to get involved. Our first issue of "inspire" is now dedicated to Olivia. We are offering the digital copy of the magazine at varying amounts with all proceeds going to the Olivia Genteman Benefit Fund. Oivia provided a very touching article, and we are so excited to be able to share it with all of you. Let's show this girl and her family that we have their backs!! NO ONE FIGHTS ALONE!! SCROLL BELOW TO FIND THE DONATION OPTIONS. CLICK THE COVER THAT REFLECTS YOUR DESIRED DONATION AMOUNT, AND YOU WILL BE TAKEN TO CHECKOUT TO COMPLETE YOUR DONATION AND VIEW YOUR VERY OWN DIGITAL COPY OF THE MAGAZINE! If you do not want a digital copy of the magazine, but you would like to help support Olivia, the Olivia Genteman Fund has been set up at Scott Credit Union in Highland, IL.